Flat rate computer repair Monday thru Saturday. Hourly onsite, pick up, drop off, and setup services. Over the phone and on the computer support. GTI offers many onsite services from computer setup, peripheral installation, data transfers, virus cleanup and scheduled updates for home and business customers. We have experience with personal and business environments including domain computers, networks, remote desktops, and VPN solutions. Although we recommend some services be performed in store for cost savings we understand that some critical systems need work done onsite. We offer pick-up and drop-off service for a charge of ½ hour for each way to and from store for customers that are unable to bring in their PC themselves. On-sites are billable per hour and estimated times for repair are not guaranteed. If you have an immediate issue with your computer we may be able to provide remote support using our web portal to help you with a popup or configuration issue that does not require full service. GTI is in the Ashley Shopping Plaza located on the Northside of Beach Blvd, just passed 295, in-between Huffman Blvd and Kernan Blvd. We are across the street from the Alhambra Dinner Theater. Our normal business are open 10 am to 6 pm Monday through Friday, and on Saturday we are open 10 am to 2 pm. Sundays we are closed. Business hours are subject to change due to holidays or emergencies. Please call us ahead of time to avoid inconvenience: (904) 998 7555. We believe there is a need for quality products and services in Jacksonville, Florida. We offer a selection of new, refurbished, and used products. As well as, providing custom solutions for you or your business in store, on site, or remote. Sounds simple enough, but it’s what sets us apart from others. We offer a full range of IT and security services to customers of all sizes. We offer new OEM, custom built, and quality refurbished systems. We also offer parts and accessories and technical service on site or remote for in-home and business environments. We provide sensible, powerful solutions that meet customer needs. 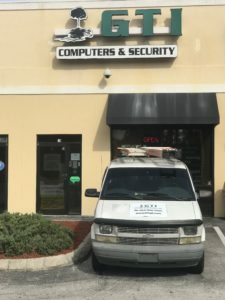 We also provide: PC and Apple Computer repair, data recovery, networking, cabling, IP & CCTV, Cameras, Installations, Consulting, Retail Parts Store, Onsite, Service Contracts and PC Upgrades for Home & Small Business Customers, Virus and Spyware Removal, Windows and Security Updates, New Custom Built Servers, Workstations, CAD Computers, Custom Home Entertainment, and Gaming Machines . Do you have a question about a product or service that we may offer? Contact us to begin a new request, and we will be happy to assist you in the order that it is received. Already have an open request? Follow up with us, and check the status of an existing ticket.